If you do not want to buy the full book, Jim Trelease shares a lot of the books and their reviews on his site (here). 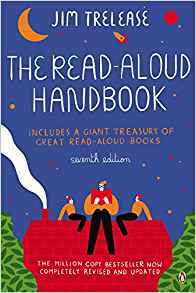 1) Research shows that reading aloud to children improves their reading, writing, speaking and listening abilities and best of all, their attitude about reading. 2) Research shows that it is not the toys in the house that make the difference in children’s lives, it is the words in their heads. So firstly, make sure you spend time talking with your child. Here is an interesting fact: parents talk with the child twice as much if the stroller faces toward the parent (obviously if the parent is not on the phone all the time). Secondly, reading provides much richer vocabulary than oral communication or TV, so start reading aloud as soon as possible. 3) Finland refuses to teach children to read until age seven and boasts the world’s highest reading scores. There is no need to push earlier reading skills. Instead, research shows that the children who were read to at least three times per week had a significantly greater phonemic awareness when they entered kindergarten and they were almost twice as likely to score in the top 25% in reading. 4) Children can hear and understand stories that are more complicated and more interesting than what they read on their own. So do not read to 6-year old Dr Seuss as those books with controlled vocabulary were designed to be read by children not to children of this age. But Dr Seuss’ is great to read to a baby or toddler as reading for this age is not about the plot but about the sounds (rhymes, repetitions, dramatic or silly sounds, etc). 5) The children are never too old to be read aloud. 6) It is better if you can read the book before you are reading it to your children. That would help first to decide that the book will be worth reading (remember from the previous week blog about complexity of a story or a narrator, archaic text, etc) and if it has appropriate emotional level for your child. It also will help you to make reading more exciting and better organise the discussion after your reading. We are all short of time, so I now “cheat” and listen to audio books at a faster speed (while walking) before reading it with my children together. And also if you start a book and you (or children) do not like it, just leave it. I remind myself that all busy people find the time for the things they truly value and I set now a daily time to read aloud to my children at home. More importantly, we set now regular reading-aloud time to our after-school club at 3 House Club (for the children we pick up from local schools). It is amazing how little things can impact growing minds.